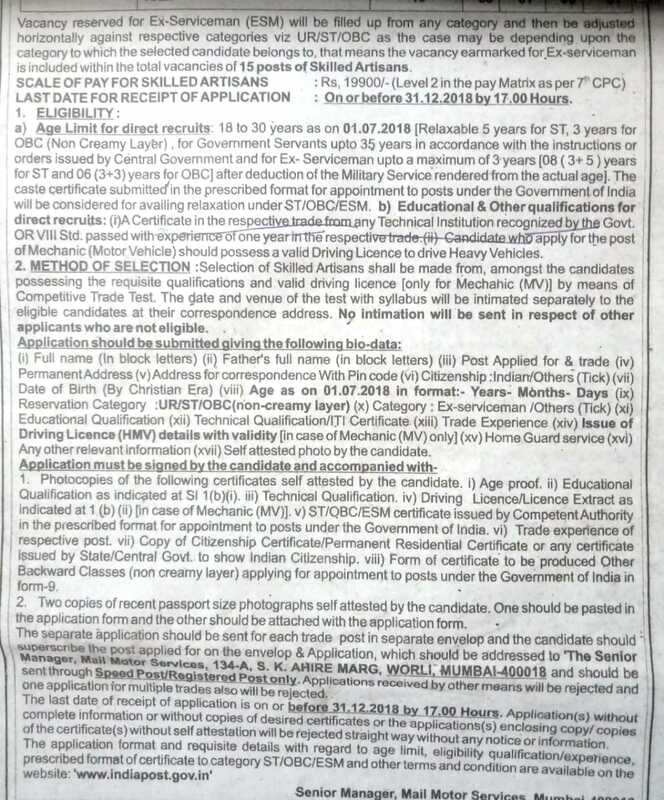 Department of Posts invited applications from the eligible and interested Indian Citizen for the various posts. 15 Skilled Artisans (Motor Vehicle Mechanic, Motor Vehicle Electrician, Welder, Tyreman, Painter and Tinsmith) required in the Department of Posts. The Last date of receipt of application is 31-12-2018, interested and eligible candidates can apply. Eligibility for the post of Skilled Artisans in Indian Posts. Age Limit: Minimum of 18 years and Maximum of 30 Years as on 01/07/2018. Educational and Other qualifications for direct recruitment: Applicants should hold a certificate in the respective trade from any technical institution recognized by the Govt. OR VIII Std. passed with experience of one year in the respective trade. Pay Scale: Selected candidates will be paid Rs. 19900/-. Detailed Notification for the Department of Posts, Skilled Artisans.